What drives ordinary mortals to feats of unnatural strength? Is it the fame, the glory, or a morbid desire to inundate half of the continental United States with water? 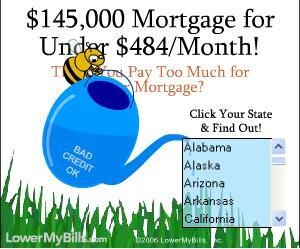 The buzz around this ad is that the bee featured is a supervillain. Lower mortgage rates mean more people buying more houses; more houses mean less flowers. Less flowers means less honey, and ergo, less bee. When threatened with extinction, all living creatures, even giant insects that can lift a whole pitcher of water, will strike back with vengeance. Hasn't mankind learnt anything from Super Mothra documentaries?